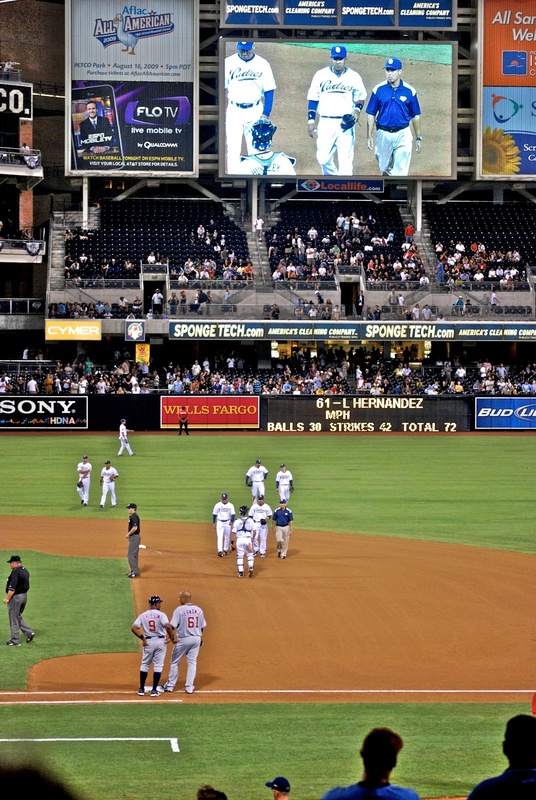 San Diego — San Diego Padres outfielder Oscar Salazar (centre on the jumbotron) left Monday night’s game against Washington after hurting himself while making a spectacular over-the-shoulder catch in the seventh inning. With a runner on first, one out and the Padres leading 2-1, Salazar caught Willie Harris’ fly ball on the warming track, the slammed into the pitcher’s scoreboard. He bounced off the scoreboard, limped a few steps, threw the ball in, then fell to the grass and grabbed his left knee. After being tended to, he walked off on his power and was replaced by Drew Macias. Normally an infielder, Salazar made his first start in left field. It happened so fast I wish I would have caught the catch on film instead of after the incident. He suffered a strained achilles tendon.